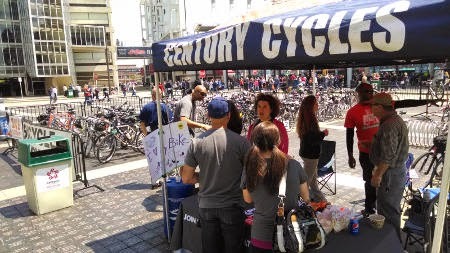 Century Cycles Blog: Thanks for Biking to the Ballpark! The First Annual Bike to the Ballpark was a huge success! Century Cycles worked with Bike Cleveland and the Cleveland Indians to encourage people to ride their bicycles to Progressive Field to watch the Tribe take on the visiting Oakland Athletics. 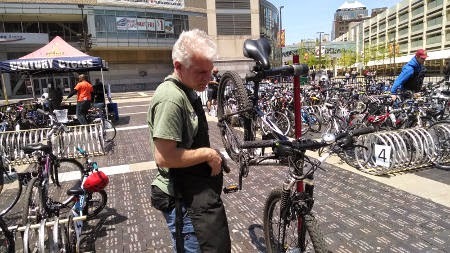 The first 200 people to arrive by bike got free, secure bike valet parking and a free safety inspection by Century Cycles' expert bike mechanics! Unfortunately, the Indians fell to the A's in a loss of 13-3. See you at the ballpark next time!